100-meter long ‘Tunnel of Light’ leads to the festival grounds. As year-end illuminations have multiplied around the island, newcomers to the game have to come up with novelty ideas to attract their fair share of the crowds. 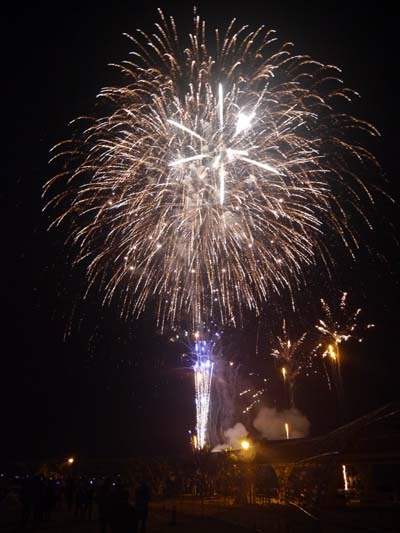 Fireworks ring in the New Year at Chura Sun Beach exactly at midnight. Toyosaki Seaside Park has taken into play an asset that should be natural for Okinawa, its Chura-Sun Beach. Through Dec. 31st the beach will feature an array of LED illuminations, including a 100-meter-long illumination tunnel, 10-meter-high symbol tree and rest spaces decorated with various lights. 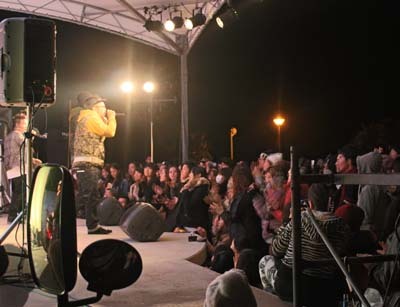 Leading to the high-point of the New year, various events like street performances and concerts are taking place at the venue. 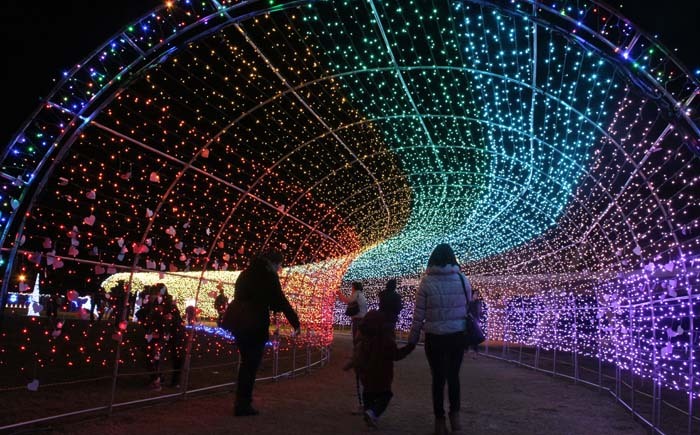 The lights are turned on every day through Dec. 31st from 18:00 to 22:00 at the South side multipurpose area of Toyosaki Kaihin (Seaside) Park in Toyosaki, Tomigusuku City, Admission is ¥300 for visitors of high school age and older. Younger children are free. The big event is on Dec. 31st, when the beach is open from 18:00 to midnight. The evening will feature live music by performers from Live Bar BIG and Mika Fujisaki starting 21:00. DIAMANTES will step on stage at 23:00 and fireworks will ring in the New Year 2016 exactly at midnight. Live entertainment welcomes the New Year. The cost for the countdown is ¥500 for adults and high school students. Junior high school students and younger children are free but have to be accompanied by an adult guardian. Organizers also say that children of junior high school age and younger are not allowed stay at the event site after 20:00, and high school students need to leave by 22:00.